GoPro is to cameras and small drones what BLACK & DECKER is to the small power tools market. As you will see in the small GoPro Karma with HERO5, you will be able to capture the best footage with the camera, whether you use it handheld style or you fly the drone and shoot from the air. Just to clear things up, Karma is the drone and HERO 5 is the camera. This camera drone is feature-packed. It has some awesome things that you should test, and then you will know why it was all the rage in the market when it was launched in 2016. 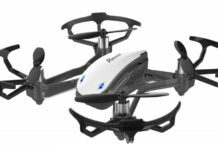 However, a couple of months later, it would be recalled after battery issues caused the drone to come plummeting mid-flight. The problem was rectified and today, it is one of the best small drones in the market. 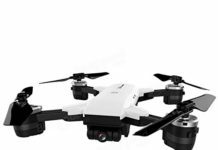 Starting with the design, you will notice that the GoPro Karma is made of a hard plastic frame that can weather abuses and not-so-pleasant landings. 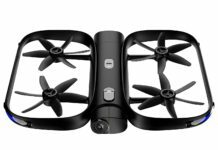 You will also notice that the drone is slimmer than many of its counterparts in the market. The reason for this is that the gimbal axis has been mounted on the nose rather than under the drone as is so usual with many drones of its size. For the size, maybe we can say that this drone is made for traveling. It is sold with its well-padded case and by padded, we mean if you drop the case, it will absorb all the shock and your drone will be safe. GoPro Karma measures 36.5cm by 22.4cm by 9cm folded. You can see it is small, but it is not as small as the Mavic Pro. The good thing is that it folds into a compact and slim device that will fit nicely in your traveling bag. The camera is everything in a drone. Now, the GoPro Karma camera sits on the nose and this means that when you start shooting pictures and videos, you can be assured that this video is going to shoot videos and images with a lot of background because the camera has a lot of upward swing thanks to its nose location. This also means that the rotors will not be captured in the video or image shots. Surprise! Surprise! 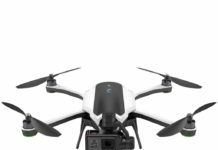 The HERO5 camera is not permanently attached to the drone. You actually can detach it by pushing open a clamp. You can also pull out the gimbal and use it with a GoPro mount. This camera is waterproof for up to 30 feet, isn’t that something? The controller is one of a kind because it has joysticks as well as a 5-inch touchscreen. When you are traveling, you will love that this controller folds into a nice, compact device. For the flight, this drone has been designed to fly with four modes. When flying in Orbit Mode, the drone can orbit around you, shooting video and photo footage from all angles. Reveal Mode means you can send the drone on a preset flight line. Cable Cam Mode works the same as Reveal Mode, and Dronie Mode allows the drone to take selfies and then retreat to some distance so you can see the photos it has shot. Through the touch display, you will be able to get a first person view just as you would see if you were inside the drone. 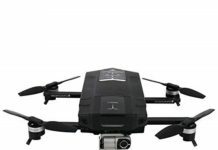 The battery of the GoPro Karma can last 20 minutes of flight, which is more than most drones offer in the market. The top speed is 35mph, and the flight range is 1000 meters. It might be a little unstable when flying in windy conditions though. 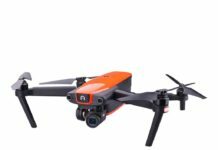 I love the versatility of this camera drone and certainly, I have seen great quality in the photos and videos that I shoot with it. Davis W.
Just like good karma, the GoPro Karma comes back to me when it has about 2 minutes of flight time remaining in the battery. As my first drone, I find it very easy to fly. I would recommend it for beginners. Regina T.
I bought this drone for my daughter on her fourteenth birthday and having had some experience with drones, I did not think there was much to it. However, I was surprised to find that it packs so many features. Han C.
Who Should Buy GoPro Karma with HERO5? The GoPro Karma with Hero5 is without doubt of the best small drones for beginner as well as advanced pilots. It is such a joy to fly. 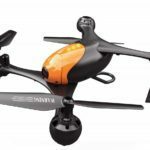 If you are a hobbyist or a professional photographer, you will love using this drone. It will shoot awesome silky smooth photos thanks to its stabilization feature. 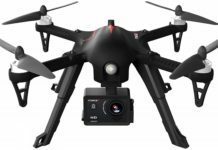 You may also buy this drone if you are an outdoor enthusiast and would like to shoot videos when you are out there mountain biking, off-roading, kayaking or on some other adventure. 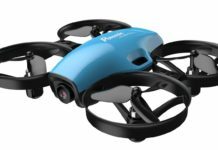 The camera is also detachable and waterproof, so you may bring the drone for your snorkeling and scuba diving adventure, but only the camera is waterproof, not the drone! Having seen the features of the GoPro Karma with Hero5, you can buy it with the assurance that you will get the best videos, photographs and service from your investment. To get better flight time, you may consider buying an extra battery. You are advised to fly it in relatively flat areas for easier landing, as it seems to have it a bit rough when landing in not so flat places. Also, fly the drone in open places as it does not have collision detection abilities. 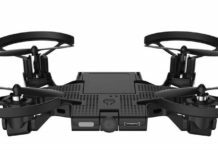 Other than that, this drone gives good value for money through its features.